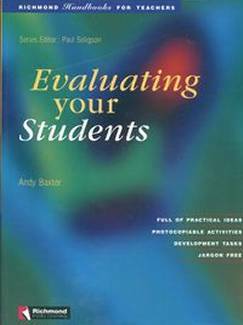 Evaluating your students examines the area of testing and evaluating in a problem-solving way. It presents the prblems of why, when and how to evaluate; it analyses the criteria that make a test good and helps to you apply these to your won testing. The book does this through an examination of cureent popuilar test types, encouraging teachers to adapt these to their own situations. As well as the traditional focus on the final written task, it also looks at other options, such as evaluating oral skill and continous assessment.